Imagine a company without managers or employees but a ton of leadership. One that has a physical address only because, by law, it needs one while it uses the world as its playground. Where the status quo does not exist. Nor does a hierarchy or a vacation policy. Where teams who work together may have never met, but their collective ideas and expertise melt together to create the most innovative solutions to business’ most vexing problems. We have recruited the best minds in a mere matter of a few months. Their experience is vast. The collective knowledge and wisdom frightening. 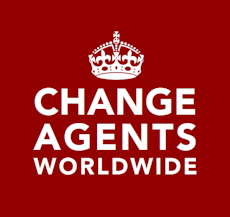 Led by the brilliant Susan Scrupski and co-founded with Jim Worth, Joachim Stroh, Eric Ziegler, Rob Caldera and myself, Change Agents World Wide is challenging the traditions of business and helping our clients to discover a new way to function. Take a look at a number of our members. Names you know and trust. We have just barely begun. Our first client, Salesforce.com, used Change Agents World Wide (#CAWW) to come up (in short order) with a script for a video on the benefits of collaborative, social work. Working with the incredibly talented The Tremendousness Collective, the following video was the end product. It was shown at Salesforce.com’s mega event, with over 110,000 registered attendees. What does CAWW offer? The collective expertise of dozens of diverse professionals whose goal is no less than to change the world. Oh ya, and all that wisdom is collected to solve your business’ problems. Not a bad prospect, eh? Moving Forward with Social Collaboration with thought leaders Harold Jarche and Simon Terry. Be prepared for more awesomeness to come.